Of all the High Street chain eateries, EAT is my fav as there is always one a stone throw away and unlike the other chains, they will gladly serve their noodle tubs first thing in the morning. 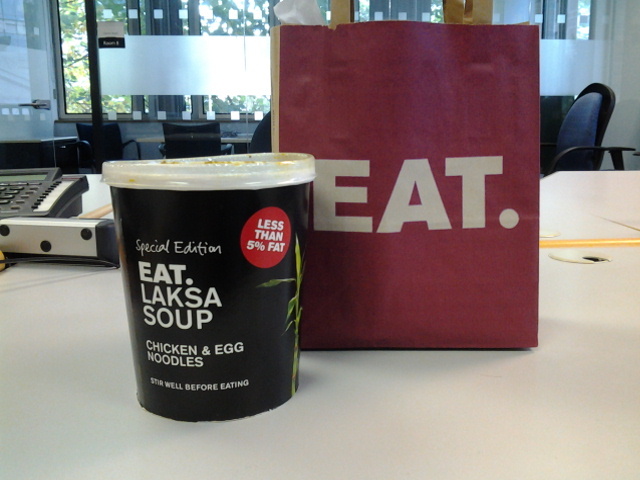 I usually get their Chicken Pho but today, there was a limited edition Chicken Laksa and thought I give it a try. If it’s up to mark, was thinking perhaps we can have a 3 way laksa off. When you enter EAT, you walk up to the fridge section, select your tub (I always weigh a few tubs looking for the heavier one! ), go to the counter and the server will top your tub up with their generic broth. What makes it laksa or tom yum is the spice paste added to the tub. At £5.35, slightly more than the Chicken Pho (£4.99) but I think I can afford it. I try not to judge books by their cover but was not enthused when I lifted the cover of the noodle tub. There were globules of the laksa paste floating around the clear broth while I was expecting a uniform creamy soup base, not very pretty. After giving it a good stir, things got better. 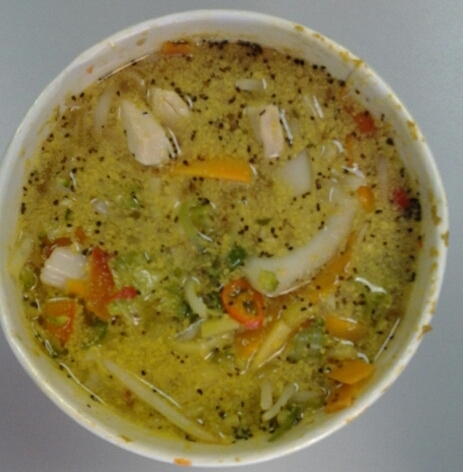 The laksa paste amalgamated into the generic broth forming a pleasant, slightly creamy and spicy soup. 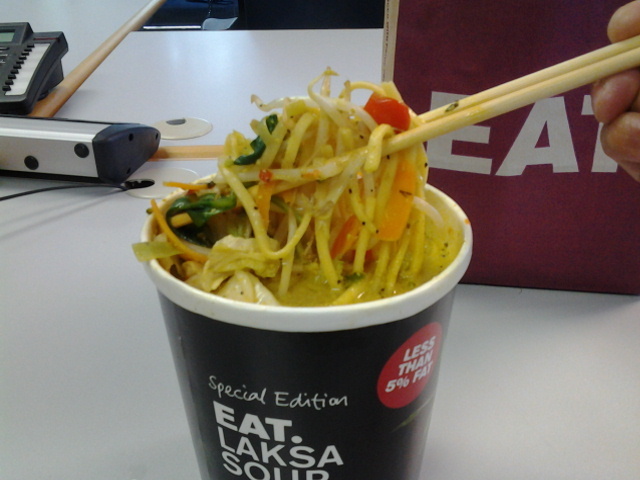 It will be a stretch to call it a laksa but for what it is, it’s pretty yummy. Other condiments apart from the chicken breast and egg noodles are chinese leaf, bean sprouts, spinach and a melange of chopped up veg. Unfortunately, I don’t think this will be a fair contender for the laksa off but do give it a try if you have a chance and if you like things spicy, get the server to add in a dollop of chilli paste to your tub. This entry was posted in Asian, Malaysian, Noodles, Soup, Takeaway and tagged egg noodles, high street chain, Laksa, melange by junk4lunch. Bookmark the permalink.